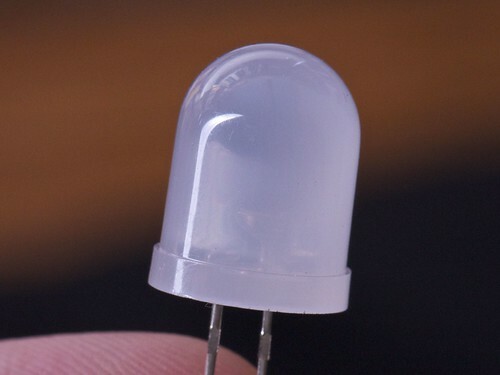 A few weeks ago we got a batch of LEDs– a sample order from a new vendor. 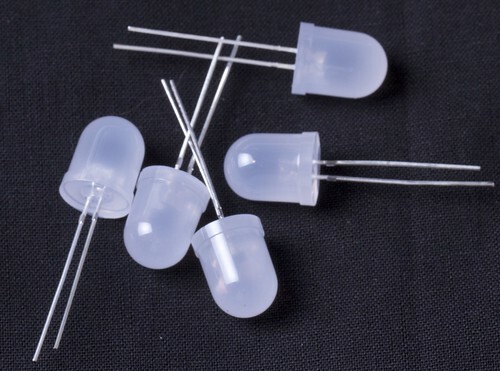 These are 10 mm diffused white LEDs, much like the ones that we use on the Peggy 2 or in the LED Ghosties. On the surface, they look okay. But after lighting them up, we noticed something funny in a few of them that led us to discover their deep dark– or really, shallow and clear –secret. 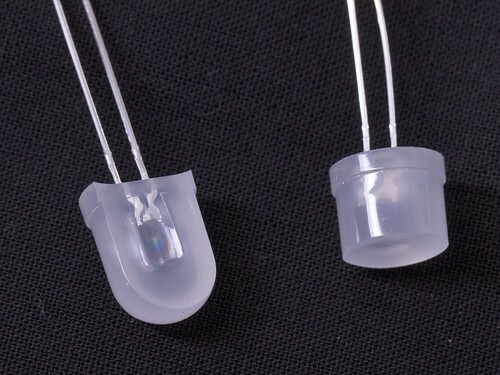 Here’s what we expect from a 10 mm diffused-white LED: The milky white plastic, lit from within, produces a bright and uniform white surface, viewable from a wide angle. 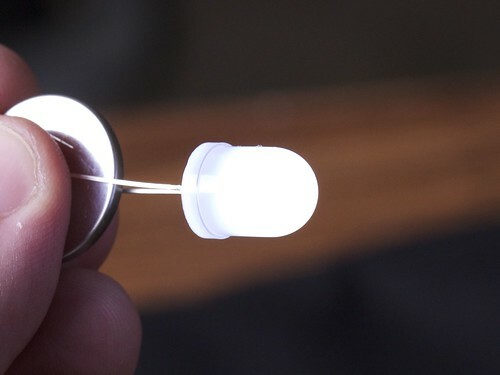 But for this particular set of LEDs, the pattern of illumination is different. Viewed from the front, there is a lot of light emitted over a wide viewing angle, but it’s much stronger towards the center. Looking more closely — and stopping down the exposure to be able to resolve it with the camera — you can see that there’s a central white spot. As you look at the LED from different angles, it becomes obvious that what you’re seeing is the LED element with its phosphor. That central bright spot is what you’d expect with a clear epoxy lens, and the surrounding halo is what you’d expect for a milky white diffused lens, so what’s the story? At this point our best guess was that the epoxy used to form the lenses was something like diluted milk: a fair diffuser that you could still see through a little bit. Not so big of a deal, maybe? Our next clue was this. On some– just a few –of the LEDs, we noticed a dark band around part or all of the circumference: a place that isn’t getting lit up like it would with our normal LEDs. Could this just be an optical effect of the different lens material? That turns out not to be the case, of course. 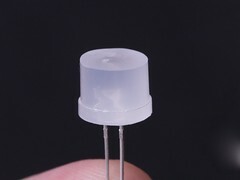 Here’s one of the LEDs that exhibits the “dark band” defect. With the power off, you can actually see that there’s something strange about it. In the middle part of the LED, there appears to be a bubble. 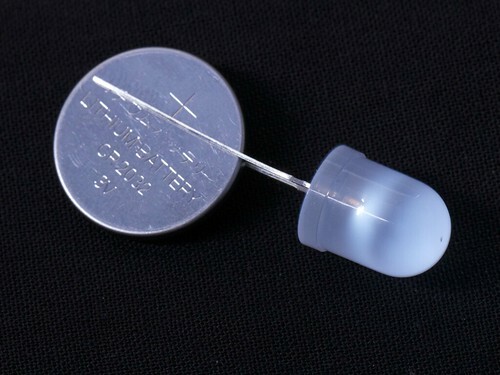 A wide, thin, iridescent layer inside the LED– maybe a microscopic air gap. A bubble inside could explain the dark bands easily. A bubble is an interface where light incident at certain angles could be subject to total internal reflection— meaning that light reflects inward and does not make it to the edge of the LED where we could see it. Depending on the uniformity and shape of the bubble inside, the reflected light might hit another interface or be transmitted out on the other side. And that’s just what we see. On the left, an LED with a fairly severe dark band. On the right is that same LED viewed from the other side (note the battery orientation in the two photos). 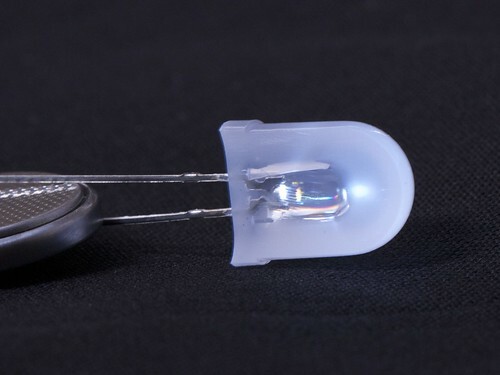 The secondary bright spot– near the top of the LED –is from the reflection of the light off the internal surface. In other words, it’s the light “missing” from the other side. This strongly suggests that the problem is in fact some sort of a bubble or other optical interface capable of producing total internal reflection. Finally, we came to the step that seems obvious only in retrospect. 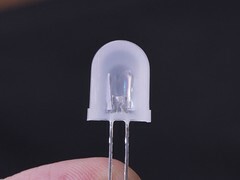 Looking at the LEDs from the bottom (“where the LED don’t shine!”) it looks like the center part of the LED is a different color. It’s almost like– no it’s exactlylike — they took a regular 5 mm clear-lens LED and cast it into a 10 mm diffused outer shell. First: Really? Can we verify that? Second: If so, why? 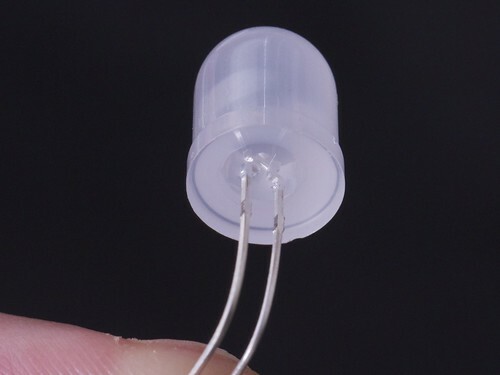 Is this just reprocessing of more common 5 mm LEDs for convenience or to save money, or is there a reason why you’d want to do it this way? Certainly one might imagine legitimate reasons for planning to build LEDs this way– for example to get a higher total intensity output from the LED than you get with the full-on diffuser lens, or perhaps to get that forward-brighter intensity distribution. These photos also suggest an answer to the second question. 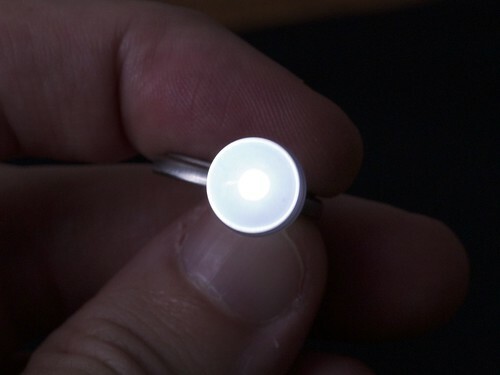 That 5 mm LED is not particularly centered in the 10 mm cross section. It’s instantly clear that this is a hack job. 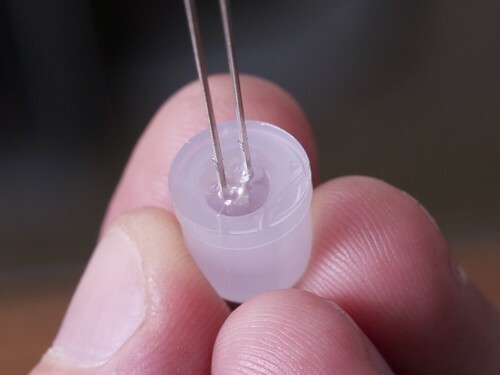 If this were planned and made by a factory that normally does this, they would use some sort of a jig to center the LED in the larger mold, much as they do with normal 10 mm LEDs. 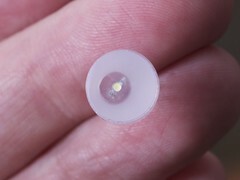 In the side cross section, you can see part of the “bubble” around the embedded 5 mm LED. 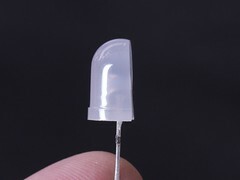 During the casting process, the diffused epoxy did not fully wet to the already-formed 5 mm LED, and so there became a thin air gap between the two plastics. The interface is slightly iridescent, showing colors that are a result of the same thin-film interference that causes iridescence in soap bubbles. This entry was posted in EMSL Projects and tagged LEDs. Bookmark the Permalink. 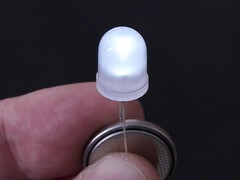 can you let us know where you will not be buying these LEDs from again? Interesting! And oddly pretty. Will you be using these sliced? for throwees? Slice them all? No… hadn’t planned on that! and the fact that they were not up-front with you about these being (cough) ‘upgraded’ (lol); that would also annoy me. 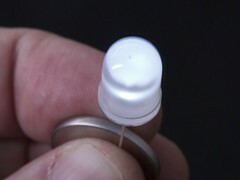 Annoying, yes, but it’s nowhere near as dangerous as those caps– this is the correct device, electrically, just the plastic shell is out of spec. I don’t even use LEDs, but this is geeking out at its finest. looks like they put them in a mold and filled it with hot glue (hence the haze).